A Keynote 5 wishlist – because 2009 will be the year presenting well comes of age, and Apple will lead the charge with Keynote. I’m preparing to head to the US where I’ll enjoy some R and R in Miami/Fort Lauderdale then head across to San Francisco to Macworld. You see, I’m strongly of the belief that Apple’s Keynote, which I’ll be using to discuss my Presentation Magic ideas – actually, more than discuss, I’ll be exploring Keynote’s capacities to render great persuasive presentations – is due for an update very soon. We’ve seen over the past twelve months or so various Steve Jobs keynotes (remember them?) where he has shown new transitions and builds (animations for those of you switching from Powerpoint), which have eventually found their way into the next update to Keynote. Would it not be ironic that at the 2009 Macworld keynote, to be delivered by Phil Schiller, that Keynote and iWork get a makeover, updated for 09? There have been a number of point updates in the time Keynote has been in version 4, as the Wikipedia entry shows here. Going from version 3 in iWork 06 to version 4 in iWork 08 (does that mean perhaps that we have to wait for iWork 10 which sounds awful?) produced a massive overhaul including alpha masking, new transitions and “smart” builds, and most importantly motion effects, Keynote’s most glaring deficiency compared to Powerpoint. My conference preparation has been centred on the current iWork 08 version of Keynote, as I’m not party to any beta testing of the next version. But my dilemma centres around what I might have to do in the two days I have to work with other Keynote afficionados: stay with what I have prepared or spend time exploring some of the new features of any new Keynote that might be released in a few weeks. As it is, I’ve probably overprepared the syllabus for the two days. Including any coverage of a new version means leaving something out… looks like it could be a late night on Day 1 (Wednesday) if the crowd asks me to go over additional features in a potential update. Actually, to do so removes some pressure to be spot on with my choice of materials and ideas the attendees could be exposed to… I’m quite happy to “wing it” should it come to that, and I’m guessing an excited Keynote-oriented crowd would be quite forgiving if I slip off the prepared syllabus which they’ll receive in a workbook I’ve prepared. Let’s imagine for a moment that Keynote 5 will be released at Macworld 09… spend a few moments with me fantasising how to improve upon a great presentation tool. It’s important to visualise this every so often, by the way, lest you settle for what Keynote allows you to do rather than stretch beyond it. 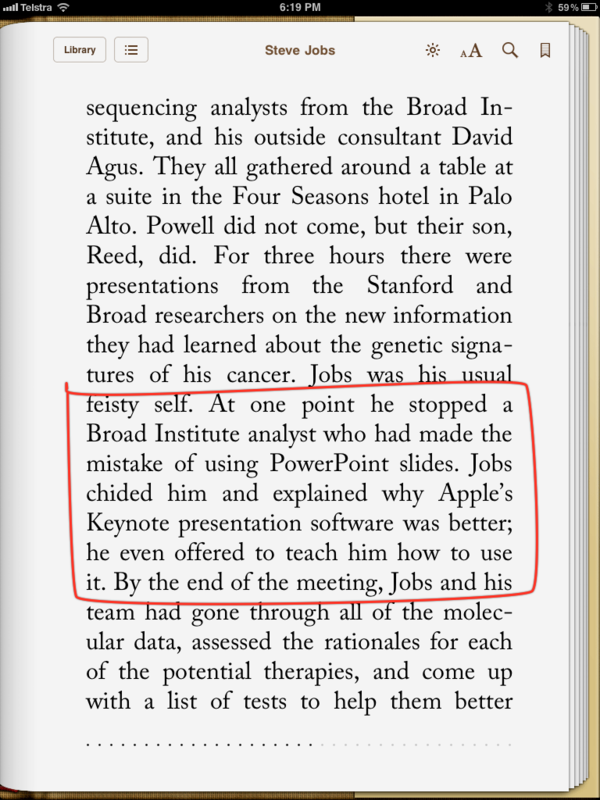 To do this would be to create a “Cognitive Style of Keynote” and see it vilified in much the same way as Powerpoint. No, we have to think outside the rather creative box Keynote has constructed for us, and push the limits as we currently understand the workings of message delivery systems to broad audiences. Some people have suggested to me that I ought to focus more attention in these blog entries on presenting in general and not be so Keynote-specific. Their suggestions are warmly received and where possible I try to balance my general ideas and views on presentations with entries on Keynote alone, albeit tied in with better presenting skills. I could I suppose write more positively about the elephant in the presentation room (Powerpoint) and possibly generate more work for myself from corporations and industries who see no alternative to it. But guess what? 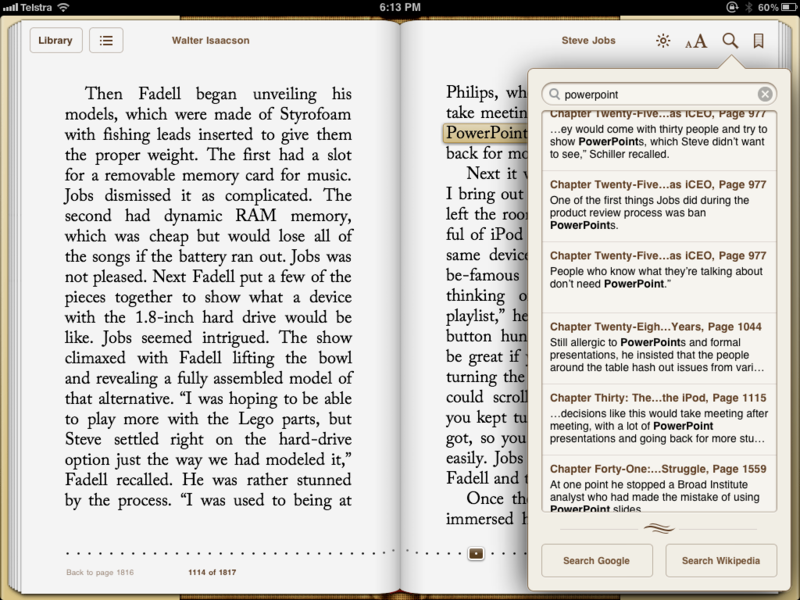 There are thousands of people writing, discussing, blogging and authoring about and with Powerpoint. Why would I want to, minnow-like, jump into a Pacific-ocean sized pond and try and get my message out there? At some point, we each have to make decisions and follow them through as far as we can, and for me it’s advocating Keynote as the better knowledge-sharing tool, because of the means by which it seems to generate greater creativity and workflow styles than Powerpoint. It seems “truer” to the cause of memorable presenting, despite its shortcomings and fewer features than Powerpoint. If that means losing out on workshop and training opportunities because I won’t toe the corporate line, so be it. Been there, done that, no thanks ma’am. I much prefer to work with those who can see beyond the Marketing Department’s demand that each slide has the corporate logo taking up valuable real estate. Was 2008 the year we changed how we thought about presenting? That said, I want to share with you my belief that 2008 was a turning point for Keynote and presentations in general. Seriously. 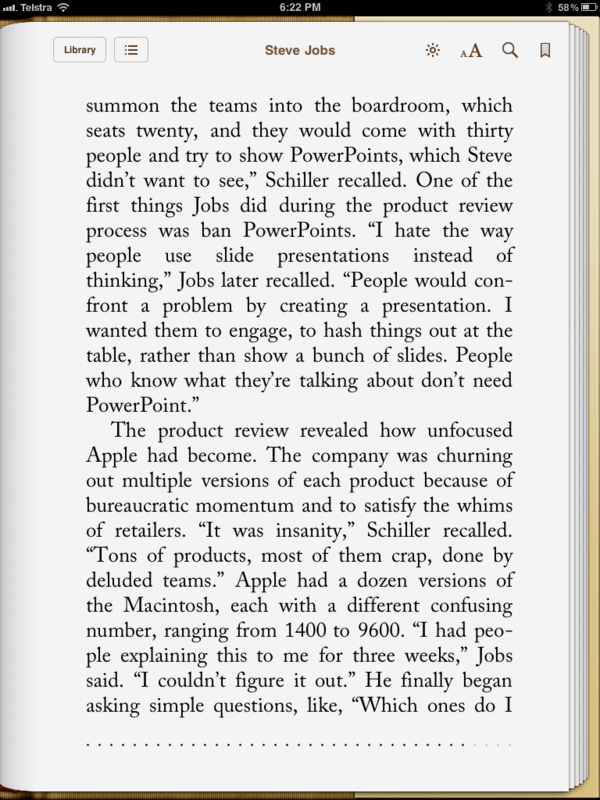 It came about through the massive increase of Mac sales, each with a full working demo of iWork installed. It came about through the publication and wonderful take-up of books like Presentation Zen and Slide:ology, and the creation and exposure of sites like Slideshare. It also came about because of the massive public awareness of YouTube and the expectation of higher quality multimedia now that the technology to do so is inexpensive and easy to use. Web 2.0, or social media seemed to reach a certain developmental stage where old-fashioned textual information exchange was inadequate to the task. It came about when Macworld allowed me to have some time with attendees and present about presentation skills, and then left the video of the session (or the slides with narration) up on the Web. And like so many things, all technologies have a limited time span to make their mark before something new comes along. Last year (2007) marked 20 years of Powerpoint, and on that anniversary we had time to pause and ask if our communication skills are any better, despite the clear demand that abundant information from a huge reservoir of sources deserves better means of knowledge transfer. And probably that hoary old chestnut that so often saw education-based IT department heads condemn Macs to the graphics department – “kids need to learn on the hardware and software they’ll use when they leave school” – was also finished off once and for all. 1. Highest on my list of priorities will be some kind of timeline addition to the Inspector. This will allow for much more precise timings of builds, and much better matching between sounds, the delivery of text and images, as well as movies. Apple introduced many users to the concept with the original iMovie, with its video and twin audio channel timelines for precise editing. This continued into the video Pro apps, and then returned in slightly different form when the iLife suite was introduced, including Garageband. It too allowed for precise matching of multiple tracks including in an updated version, graphics for podcasts. It’s clear that Apple engineers understand the importance of precision editing. At the moment in Keynote, it feels pretty much hit and miss, requiring much manual tweaking. I want to go one step further though, as so far the timeline pertains to a slide. I’d like to see a Master timeline so that audio can be faded in and out across slides, not just within. At the moment, in order to do that, you need to export the sequence of slides as a Quicktime movie into iMovie (for instance, or it could be Final Cut), add the desired sounds including any “ducking” using the provided timeline, then import into Keynote. I’ve found this produces less than sharp images and text. Better to do it within Keynote. 2. Greater control over the choice of slides to allow less linear operations. At the moment if you hit the command key in Keynote it will bring up the current slide and one each side of it (i.e., before and after) when in Presenter Mode (current and next slide is visible to the speaker). But there are times when that choice is limiting. Currently, the work-around is to printout the slides (including all builds on the one slide) and clearly number them so you hit, say Command-42 to take you to that slide. My preference would be a means to view all slides using a hot key selector then point and click on it to go straight there, leaving the audience unaware of this occurring. Perhaps some integration with the iPhone or iPod Touch in wi-fi mode will allow some measure of this to occur, with the handheld unit acting as both remote and Preview device. While in Presenter mode I’d like to be able to see all the linked hot-spots I might have created on a slide, where clicking in the area would take me to that slide in the Keynote deck. At the moment, it’s doable, but requires fiddling and guesswork. 3. Free form line drawing. This is a real oversight, where I now have to use a third party drawing application to draw precise curved lines, then import it into Keynote. My preference would be to allow Keynote to do this, as long as we don’t end up with a top-heavy inspector, which starts to look like the Powerpoint ribbon. Once the free form line is drawn, I’d like to be able to make an object traverse it accurately and smoothly. It’s still fiddly in the current version of Keynote. 4. Better image manipulation tools including masking. Let me be able to distort, skew and change perspective, rather than having to open Photoshop and then import into Keynote. Powerpoint has moved a great distance down this path, allowing for a great deal of image manipulation which at a pinch can be an aid to Keynote. In my experience this is not a perfect solution producing artifacts, but it’s easier than using Photoshop for novices. 5. An improvement in motion builds. There are a variety of effects I’d like to achieve, but the four motion builds (scale, move, rotate, opaque) are too limiting for some of my ideas. 6. One of the the things I like to do when creating a slide is gather all the materials I’ll be using onto the slide, or more accurately around the slide, which I’ve placed in 25% size. This gives you a great deal of surrounding white space to “store” your slide components, and plan some motion builds. But Keynote puts the slide in the top left hand corner of the work space. This is OK if you are bringing elements onto the slide from the right or below, but requires imprecise guesswork for the other two sides. Better to be able to place the slide in the centre and thus use all four sides for any motion builds. 7. Some build refinements, such that I can make an object glow or pulse to draw attention to it. I can do it now, and will show how at Macworld, but it’s a lot of clicking and pasting and effort. Drawing attention to slide objects, such as cells in a data table, or parts of an object, is now a very important element of presenting, and will hopefully do away with silly laser pointers. There are third party tools for this currently on the market, like Mousepose, but as usual. I’d prefer to see it within Keynote. To that extent, once I have constructed some builds, give me better preview options, rather than the miniscule Inspector to see how an effect will look. Now this is not an exhaustive list, and late night tiredness prevents me from adding some illustrations (which I might add in an update once I’m settled in Florida with a high speed connection). And others will no doubt have their own wishlists, which you can see if you head to the comments section of a blog entry I wrote some time back here. That blog entry was written pre-Keynote 4, just as I am writing this one, but almost two years later! And while one or two of my requests have been fulfilled, the main ones are still outstanding. It would be a pity of Keynote users spend another year or so feeling abandoned as happened between Keynote 1 and Keynote 2. Hopefully, at Macworld they’ll be an opportunity to chat with Keynote users and engineers (fingers crossed) and let them know how much Keynote is enjoyed for its ease of use and creativity-generating properties, and it shouldn’t be abandoned as Apple continues to build itself as a digital media powerhouse. To that extent, while I’ll miss Steve Jobs give his keynote in two weeks, I’m hoping that he’ll give others during product launches in 2009, and the high level of presentation standards are maintained when Apple VPs stand and deliver. Fingers crossed on that one.